It’s hard to believe that we’re already a quarter of the way through the year – Purim has been and gone, Pesach is here and everyone involved in Jeremy’s Circle has been busy either raising much needed funds or organizing events and programs. Once again we have to start with a huge thank you to all our valued supporters. 2010 has already seen some super-human efforts both in organizing fund-raising events and initiatives abroad and running events and on-going programs in Israel for the kids and families that we aim to support. 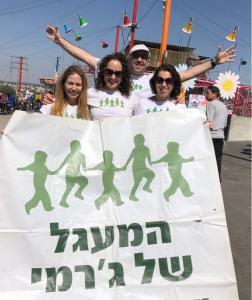 The latest event was held during the Pesach vacation at the “Hava and Adam” Ecological Park near Modi’in. The kids took part in activities designed around informal education about the environment, community and ecological issues with a Spring / Pesach theme. In addition, the parents took part in an informal group discussion with Child Psychologist, Natan Bergman, who is also a Jeremy’s Circle participant. During the long summer vacation fun days are held in different locations across the country, generally in the final two weeks of August when all summer programs have finished and most parents are desperately trying to ways to amuse the family. Last year’s events were a great success with over 100 kids participating. The plan is to extend this program, providing even more comprehensive support. So your efforts are needed if we’re to realize this ambition. Further events are held during the Succoth and Hanukah vacations and details will be available on our website and in newsletters nearer the time. In parallel and throughout the year we are continuing to run our flagship Mentorship program in conjunction with the Hillel Organization. The program matches undergraduates with Jeremy’s Circle kids and provides a much-needed outlet and additional support for the child and parents. The program is now running in Tel Aviv, Jerusalem and Afula and is such a success that plans are being discussed to expand it further into additional Israeli cities. In addition to the weekly activities of the Mentors with their kids a number of group activities have taken place including a trip to see a performance of “Almost Angels”, a TV series much-loved by Israeli kids and youth. Three students and six kids travelled to Tel Aviv to see the show and by all accounts they had a terrific day out. A book workshop was also held for the mentors on March 1st with young mums with cancer (the book authors). The mentors received signed copies of the books at the end. Of course, such programs require substantial funding to succeed and this will be a key fundraising priority for the year ahead. $2,000 covers the cost of a fun-day including round-trip transportation. We have been very fortunate to receive numerous kind donations from Bar and Bat-Mitzvahs who have decided to donate part of their gift money to Jeremy’s Circle. We are planning to formalize this process into a Bar / Bat-Mitzvah program and are currently piloting the scheme with some communities in the UK and US.